Head on over to Amanda's blog to learn more, and read an interesting article on how to keep your family healthy during cold and flu season, and be sure to enter for your chance to win one of these thermometer's (below). The new Braun No touch + forehead thermometer is the latest product to have in your family’s cold & flu arsenal. 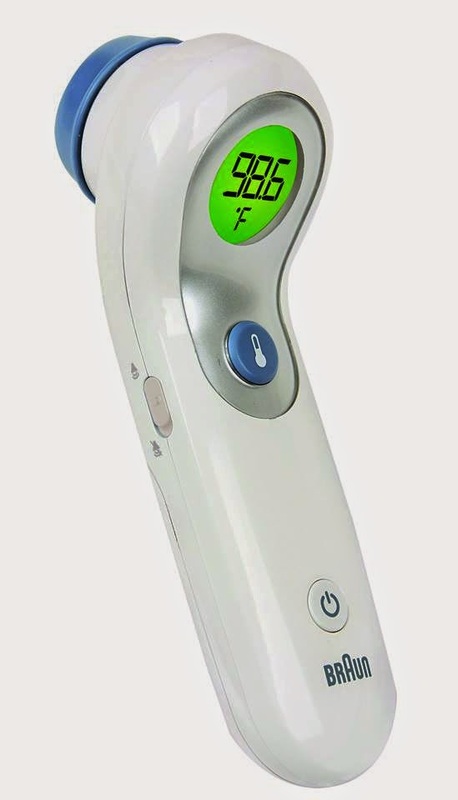 It offers two non-invasive ways to take a temperature reading, making it easier than ever before without sacrificing accuracy. One mode requires no contact, which means you can hold the thermometer up to 2 inches from the forehead to take a reading. The other requires gentle contact to the forehead in the same location. Either way, you get an accurate in less than two seconds! What do you do when you have the cold or flu? Brilliant idea. Easy - and more hygenic. When I have the cold ot flu I try and stay away from everyone else and drink lots of liquids and eat lots of chicken noodle soup! I have the flu, I stay in bed and rest. I have one of these and it;s awesome. It is so much easier to use. I try to get plenty of rest and drink lots of liquids. I usually take something for it. Drink some OJ and try to get some rest. If I'm not running fever, I suffer through it and continue working until I'm really sick. If fever comes, I stay in bed and sleep it off. When I am sick with a cold or flu, I stay in bed, eat chicken soup, and generally feel sorry for myself until I feel better! I LOVE these types of thermometers! I try to get as much rest as possible and take some sort of over the counter cold medicine. I rest as much as possible, I take a break from exercising and I try to use all natural remedies. I have a cold right now. I am not a good patient. So far I am taking as much medicine as I can, taking baths, lots of echinacea tea, and lots of rest. I actually got this one for my niece as a baby shower gift. I love all the features! It is a little pricey, but I think a good quality thermometer is a must, especially for new moms! I try to get lots of extra rest and drink a lot of green tea. I've been wanting to purchase one of these. It makes so much more sense and would be much easier to take my own temp espectially when I am sick and can barely stay awake! I have been wanting one of these for my kids! I have one of these! And they do work great! I love mine! I have one of these and love it. I love how I can use it without bothering the kids. I drink a lot of water and Gatorade, get a lot of rest and take medicine at night to help me sleep. I also blow my nose a lot when I'm sick. It tends to speed things along a little bit. We make sure to push fluids and lots of rest. I try to get better taking OTC meds. I drink lots of fluids, try to stay away from the grandkids and ride it out. I make sure I rest and take my vitamins when I'm sick. Also, try to stay away from the kids but that's so hard to do! I stay in bed, make sure I am hydrated and take any available medicine to relieve the symptoms. I usually drink plenty of fluids and get lots of rest when I am sick. I get a lot of rest and drink a lot of water and hot tea. When I feel myself getting sick, I take lots of Vitamin C and get plenty of rest with fluids. I am following all the Twitter accounts but I guess Pro simple is acting up. I keep getting this-There was an error while following the account. Please retry. I sleep a lot and try to drink as much water as possible.